Looking For #Halloween Music? 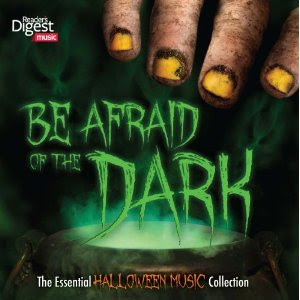 Check out Reader's Digest: Be Afraid Of The Dark Album! I've said it once and I'll say it over and over again, this is my favorite time of the year. I love Fall and everything that comes with it, especially, Halloween. For our family Halloween is a big deal. Not only do we all love the old and new Halloween movies to watch, but we also love the music as well. You know it's that time of the year when you hear the theme song, Halloween. Each year my family hosts four different parties, I know, we're crazy, but there are so many memories and good times and so worth it and three out of four are for the kids anyways, so that's okay, right?! We have a pumpkin carving party where all the cousins get together and we have dinner and then sit around listening to Halloween music as we all help our kids carve their pumpkins. This year we did so with Reader's Digest, Be Afraid of The Dark CD. Let me tell you, this album was a great addition to our festivities and will be played for the next three parties to come for the little kids, teenagers and the adult party! Not only does this album have the theme song to Halloween, but it also has Nightmare Before Christmas, "This Is Halloween," which is always a good song to play on Halloween. It also includes the theme song from Harry Potter and the Chamber of Secrets, which the kids loved because they're all fans of Harry Potter! I'm very excited to have this album be a part of our collection and we will definitely be playing it throughout this weekend and next week on Halloween for our trick or treaters to hear as well. If you're looking for great music for your Halloween festivities, this album is definitely a great add! Disclosure: All opinions are my own. I received Be Afraid of The Dark album at no cost for the purpose of this review. No other compensation was received.